Defying the strong waves of the southwest monsoon and the scorching heat of the sun, the fishermen of Pilar in Sorsogon persevere to provide for the needs of their family. They spend hours in the mid-sea despite their hunger and exhaustion just to catch buckets of fishes to bring home food and money for their family’s daily sustenance. If lucky they can directly sell “lawlaw or tamban” (Sardinella SP.) to sardines manufacturers and earn as much as P 450.00/fish bucket during the season or P 700.00/fish bucket during the off season. 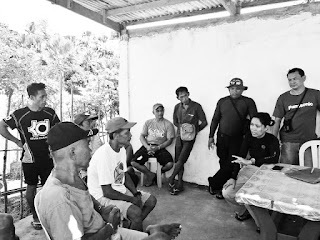 “Mapagal po talaga an hanapbuhay didi, batod dose anyos ako hanggang ngunyan na singkwenta y nuebe na ako, pangingisda pa din ang pinagkakakitaan ko, (Working here is really hard, since I was twelve years old, until now that I am fifty-nine, fishing has been my only source of living).” Domingo Jazareno said. Even with hardships experienced on his daily job, he still envisions an improvement in their life by learning new technology and skills that would enhance their capacity to increase their fish catch and engage in other livelihood such as bangus culture. Jazareno is the president of the Samahang Mandaragat ng Barangay Inapugan (SMBI), the lead proponent of the clustered fisherfolk organization from the three barangays of Pilar namely Bantayan, Inapugan and Dapdap (BIDA) where one of the pre-identified Marine Protected Area (MPA) of the Philippine Rural Development Project- Global Environment Facility (PRDP-GEF) is located. The Rehabilitation of the Marine Reserve and Fish Sanctuary in Pilar, Sorsogon has a total area of 1, 449 hectares with a total project cost P 4, 752, 900.00. The organized group will serve as the deputized sea warden to help rehabilitate and restore the marine habitat in their area. With the assistance of the LGU-Pilar, PLGU of Sorsogon and with the support of the PRDP-GEF, the clustered group will have a small-scale livelihood program as their substitute or alternative source of income. The group will venture in Bangus (Milkfish) Culture and Marketing which aims to generate employment among the members or the organization, increase in income as well as their fish catch volume. Bangus will be cultured in Panlatuan Bay for better protection from the southeast monsoon. Bangus Culture and Marketing is said to be a highly profitable business for its adequate survival growth rate, cheap supply feeds and its fast growth to a marketable prize of about 300 – 500 grams body weight within 5-6 months of culture period. To further capacitate the clustered group, PRDP-GEF organized an Experiential Exposure Training and Hands-on Implementation of the Bangus Culture Project Technology. Representatives from the Bureau of Fisheries and Aquatic Resources (BFAR) and the Office of the Provincial Agriculturist (OPAg) Sorsogon introduced new technology and practical experiential inputs to kidentify the different factors affecting the bangus growth and survival rates, feeding and nutrition, sanitary and health management, care and maintenance, harvesting and trading to help the group grow their bangus in marketable size and volume. As a part of their exposure training, participants were given the chance to visit one of the Bangus and Lapu-lapu fish cage in Tabaco City managed by BFAR. This will give them an idea of how the 10 x 10 fish cages looked like and how the fish cage implements were used. During the site visit the participants were able to experience feeding as they went from fish cage to another. Some of the deputized fish wardens assigned in that area shared their experiences to encourage the participants to venture in growing bangus. They were also trained on how to make a hapa net which will serve as the impoundment placed inside the fish cage. The members of the organization patiently sewed the hapa net to make a strong and stable cage for the fishes. “Excited na po kami na maiimplent ang project na ini, makakatabang ini na madagdagan an samuyang kabuhayan sa araaldaw, (We are very excited for the implementation of this project, this will surely help us in our daily living)” Jazareno added. The involvement of the community in the implementation process plays a vital role since it made the members to appreciate the benefits of the project. GEF aims to increase the fish stocks and biomass of the GEF covered MPAs and protects various trigger species present in the pre-identified sites. GEF related interventions include (a) provision of additional and/or alternative source of income to marginalized fishermen, (b) improving skills and capability of target proponent groups, (c) strengthening collaboration among key stakeholders and (d) updating Integrated Coastal and Fishery Resource Management Plans (ICFRMP) linking to sustainable aquamarine farming systems towards increase productivity and enterprise operations in the near future.